We live in the era of amorphous attitude toward link building. Some marketers consider it the worst and unsafest method of promotion while others can’t see anything bad or wrong about links. The latter ones are right. Despite content marketing being in trend and content being king (thanks for this phrase, Bill Gates! ), marketers still need links to please search engines. What is different about it is that content marketing development makes specialists look for a new approach to link building for pleasing both users and search engines by making those links natural. 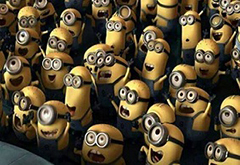 And here comes crowd marketing, a safe method to get links and make your brand recognizable. The main thing is to know how to use it right. Crowd marketing is nothing new: for example, your witty comment under this post can bring a visitor to your website; and, if your website is great, big chances are you’ll achieve your marketing goal. The thing is, before ordering and buying a product or service, users visit forums, social networks, and communities to find feedback or recommendations on it. So, crowd marketing is your chance to “help” them choose your product and give more link juice to your website. The better your product is, the better results crowd marketing will bring you. Moreover, crowd marketing can help you overcome content marketing crises: all threads and comments you post to get links and improve your brand’s visibility tie into content creation, too. Being a marketer, you perfectly understand that nothing is as simple as it seems first. Writing content to implement your crowd marketing strategy has nothing in common with writing essays or posts for your website. The goal is not writing but managing users reviews and recommendations in a way they would work for your sales in the long run. To search for questions and reviews of your product or service at websites and forums. Google Alerts, Talkwalker. To get notifications on new reviews and questions. To monitor new comments on your product or services in blogs. Tagboard, LiveTweet, Tweetdeck. To monitor followers and tweets about your product or service. Facebook, Google Plus, Twitter. To communicate with your target customers. Google Analytics. To analyze traffic and users behavior at your website or blog. You can change the list according to your needs and marketing goals, adding new instruments and services or deleting the mentioned ones. For example, if you don’t want to communicate with your target audience on Twitter, you are free to ignore all services for work with this social media. 1) Don’t try too hard. If your product is new and it gets 10,000 mentions and links all at once, Google will not consider such a promotion organic and natural because people do not promote this way. Contact some related groups, forums, and communities. Yes, you can expect signals from social networks, but do not try selling. Crowd marketing is your chance to make a buzz and get natural links yourself, as it’s difficult to make many people talk about your product or service. For example, there is a girl (let’s name her Lesley) interested in writing, literature, cute kittens, and flowers. Suddenly, she starts posting threads and answering comments on the best wrenches, stretch ceilings, or water filters. It will be a big surprise for Google because it knows Lesley’s previous behavior and interests, including websites she searched and visited. And it can’t find any websites about water filters there. “Hmm… It seems like someone has paid Lesley to build this link or write this comment.” (c) Google. So, the more people comment on products irrelevant to their previous behavior and interests, the more dangerous such links, citations, or mentions look. 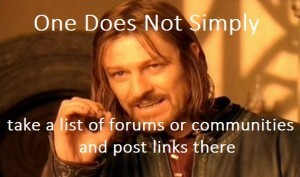 You can’t simply make a blank profile at forums or communities and start commenting or posting links at once. Blank profiles with no history signal Google about your unnatural activity, so your chances to get banned grow by far. Make sure your profiles look natural and their history is related to your product or service somehow. You are ready to spend 3-4 months on getting new visitors. You will write good and informative messages to give answers to visitors’ questions. Imagine yourself a person who looks for the answer: would you be satisfied with a type of answers you give in your messages? You are ready to search and find high-quality resources because it looks quite ridiculous to see a message about sofas in a thread about wooden chairs. You forget about the “more is better” principle. It’s always better to create 10 top-notch threads than 20 so-so ones. Do you consider crowd marketing worth trying? Or maybe it’s nothing more but a piece of balderdash to forget about and not to waste time?